Sitting roughly halfway along a timeline bridging The Little Norse Prince and Spirited Away, Taro the Dragon Boy sees Toei turning to native source material in a magical blend of myth and fantasy that is sure to inflame the imaginations of kids from elementary age upwards of whatever culture. Set in the mountainous and mysterious Shinshu Province, where in days of yore the locals eked out a harsh mountainside existence of the type depicted in Shohei Imamura's The Ballad of Narayama (1983), and based on an oral legend set in print by Miyoko Matsutani in 1962, it follows the adventures of Taro (Kato), a lazy and gluttonous whelp who spends his days loafing around in bed and filling his face with rice-balls while the grandmother who raised him breaks her back toiling the paddies with the rest of the hungry villagers. The mysterious circumstances surrounding his birth see Taro taunted by the other local kids. After his father was killed by a rockslide before he was born, his mother Tatsuyo (Yoshinaga) was forced to earn her keep working in the mountains while pregnant. 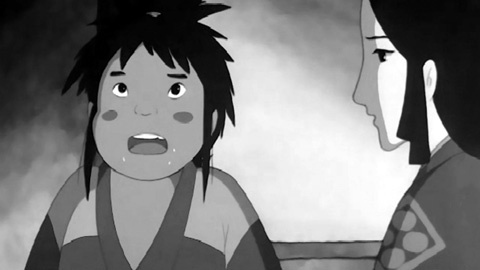 One day, during a storm, she disappeared, and Taro arrived in the village floating down the river in a basket, sucking on a ball of milk that was once his mother's eyeball. Legend has it that his mother was transformed by a curse into a giant white dragon, and now sightless, has relocated to the depths of a lake far to the north of the country. 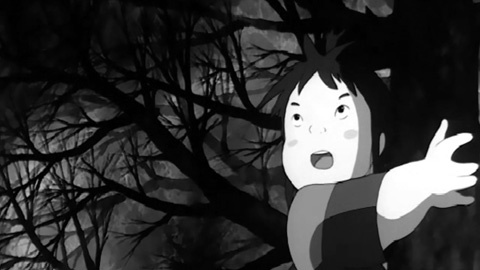 One day, while Taro is idling away his waking hours wrestling with his forest animal friends (like Kintaro, another figure from Japanese folklore whose exploits have often found their natural home in animation), a long-nosed, puce-faced tengu (goblin) appears and offers him a swig of saké. His skin taking on a pink blush, Taro is filled with an unnatural strength. He first puts his new powers to good use fending off the Red Demon, or oni (Kumakura), which goes berserk with jealous rage when a mysterious girl named Aya arrives in the woodland, charming the animals with her melodious flute playing. 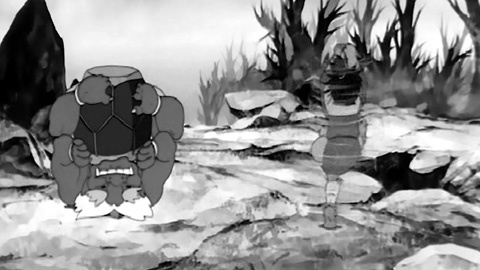 The defeat of the Red Demon marks Taro's emergence into the world of adulthood, earning him a loincloth in the process (quite a relief after all the cartwheels and headstands he does in the early stages of the film while wearing nothing beneath his short tunic! ), but before long he has an even mightier foe to tackle, when the vanquished Red Demon hands over Aya to his larger neighbour the Black Demon (Kitamura), who has a healthy appetite for the delectable young maidens brought up to the mountaintop by the villagers to appease him. 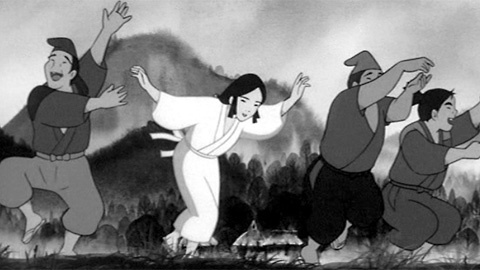 Soft, rounded character designs characterise this production as one pitched towards the younger viewer, but the film's most eye-catching aspect is the mystical flat inky-black backgrounds over which the tale unfolds, which evoke traditional sumi-e wash paintings and lend further atmosphere to Taro's later encounters with a ghastly witch in a secluded mountain cabin and a trio of spectral snow women (yuki-onna) during a blizzard as he embarks on his quest to free his mother from her curse. It might come as some surprise to learn that the main body of director Urayama's work lies outside of animation. He began his career at Nikkatsu as an assistant director and scriptwriter (in the late 1950s he co-scripted Yuzo Kawashima's The Sun Legend of the End of the Tokugawa Era / Bakumatsu Taiyoden and Seijun Suzuki's Harbour Toast: Victory is in our Grasp / Minato no Kanpai: Shori o Wagate ni), making his debut as a director in 1962 with The Street with Cupolas (co-written with Shohei Imamura). Released in the US in dubbed form on video in 1984, Taro the Dragon Boy has lain forgotten in the West ever since, making this Discotek release a particularly welcome one. The DVD presents the English language soundtrack alongside the original Japanese, making this simply wonderful film an unforgettable and inspirational entry point for pre-teens into the colourful world of Japanese animation.